Smartphone technology could transform the way people engage with some of Northern Ireland’s most iconic tourist attractions – thanks to a new app developed by University of Ulster academics. Helen Jackson and Adrian Hickey from the Centre for Media Research on the University’s Coleraine campus have worked with Belfast-based digital agency Big Motive to design History Space. The innovative ‘app’ unlocks the colourful stories behind some of the key attractions on Northern Ireland’s tourist trail. The pilot project focused on the Mussenden Temple and Downhill Demesne and the first History Space app, is now available to download for free from the iTunes App Store and Google Play. Mussenden Temple, which is perched precariously on acliff top overlooking Lough Foyle is one of Northern Ireland’s best known landmarks.The nearby Bishop's Palace and Downhill Demesnewere built for the flamboyant 18th Church of Ireland Bishop and English aristocrat, the Earl Bishop Frederick Hervey. Both the temple and palacewere lavishly decorated with frescos and Old Masters paintings, a testimony to the Earl Bishop’s lavish and extravagant lifestyle. The Temple once served as a library but it is now an empty shell. The nearby Bishop’s Palace lies in ruins but History Space will give visitors to Downhill a flavour of what it was like to live there during the Earl Bishop’s time. 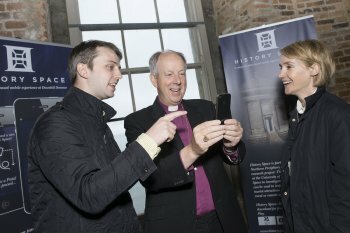 Helen Jackson said: “History Space uses the latest mobile technologies, including augmented reality and geo-location, to provide visitors to Mussenden and Downhill with new forms of interpretive content that will engage and immerse them in the history of the site in innovative and exciting ways. “The interface between the physical and the digital becomes a designated gateway that has to be physically opened before it can be entered. Among the guests at the official launch inside Mussenden Temple was the present Church of Ireland Bishop of Derry and Raphoe, Rt Rev Dr Ken Good. Welcoming him to the event, Helen Jackson said it was particularly appropriate that he was able to attend given Downhill’s strong association with the Diocese of Derry and Raphoe through the Earl Bishop. Learning Technologist Adrian Hickey explained that the History Space app will give visitors to Downhill a truly immersive experience. "By linking physical and virtual spaces, History Space prompts visitors to Mussenden and Downhill to explore the majestic cliff top location and discover the music, art, legends and stories of the people who lived there hundreds of years ago - with their phone in one hand and feet firmly on the ground. "There are lots of apps currently available to help enrich the visitor experience but most of them just transfer information that is already in the public domain. We wanted to develop something that would change the way people use technology to explore tourist destinations. He added: “The History Space app uses a range of features including augmented reality and ‘gamification’ methods to make exploring the site more fun by adding game elements. This is what makes it so unique. “To access the digital interpretive content that has been geo-tagged to certain locations within the site, the user has to find the ‘doorways’ to the content and then use the gesture recognition features of their mobile phone to physically open the door and gain access to specific items of digital content. The app features an original soundtrack and a variety of imaginative gesture-controlled games – which give further insight the Earl Bishop’s interesting character - the Midnight Philanderer, Racing the Bishops’ Clergymen, Fishing in the Black Glen Lough and Playing the Downhill Harp – with the Earl-Bishop as narrator. Downhill is cared for by the National Trust. Toby Edwards, Site Manager for Downhill Demesne said the large information boards dotted around the site give visitors some background history to the colourful cleric. “But they don’t tell the full story so we very much welcome this exciting digital development. History Space is part of the Tourist Guide for Northern Periphery (TG4NP), an international research project to investigate how mobile technologies could be used to improve visitor experience at key tourist attractions and boost the local economy in rural or remote areas. Caption: Bishop of Derry Rt Rev Dr Rev Good getting to grips with the Downhill app. Looking on are University of Ulster Learning Technologist Adrian Hickey and lecturer in Interactive Media, Helen Jackson.